Saudi crown prince deplores 'painful' Khashoggi murder in first comments - SABC News - Breaking news, special reports, world, business, sport coverage of all South African current events. Africa's news leader. 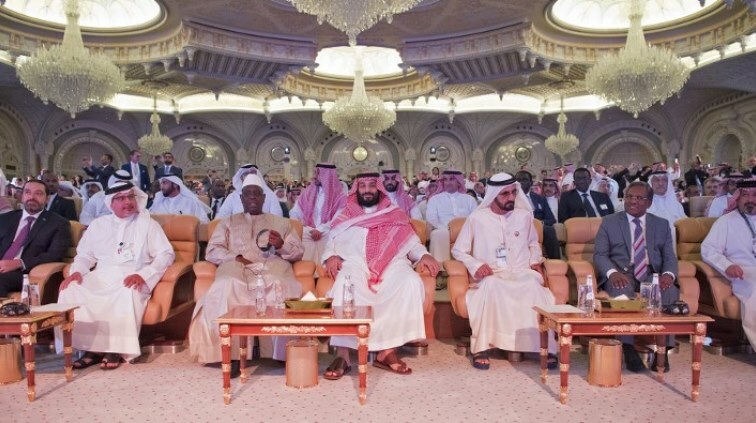 Picture shows Bahrain's Crown Prince Salman bin Hamad bin Isa Al-Khalifa (2nd-L), Saudi Crown Prince Mohammed bin Salman (C), and the UAE Vice-President and Emir of Dubai Sheikh Mohammed bin Rashid Al-Maktoum (C-R) attending a session of the Future Investment Initiative (FII) conference in Riyadh. Saudi Arabia’s crown prince on Wednesday denounced the “painful” murder of journalist Jamal Khashoggi and vowed justice would prevail, in his first public comments on the case, without addressing US accusations of a monumental cover-up. After phoning Turkish President Recep Tayyip Erdogan to discuss the October 2 killing in the Saudi consulate in Istanbul, which triggered a diplomatic crisis, Crown Prince Mohammed bin Salman also pledged there would be “no rupture” in ties with Ankara. “The incident was very painful for all Saudis, it’s a repulsive incident and no one can justify it,” Prince Mohammed said during an address to the Future Investment Initiative forum in Riyadh. “Those responsible will be held accountable… in the end justice will prevail,” the heir apparent to the Saudi throne said in Arabic. The prince, faced with mounting international censure, appeared relaxed and occasionally joked as he shared the stage with Lebanon’s prime minister-designate Saad Hariri and Bahrain’s Crown Prince Salman bin Hamad. Washington, a long-time ally of Riyadh, moved late Tuesday to revoke the visas of several Saudis. Britain followed suit on Wednesday. But Ankara has been holding its own investigation and Erdogan said the killing was meticulously planned, calling for 18 Saudis detained by Saudi authorities to be tried in Turkey. Erdogan spoke with Prince Mohammed in their first telephone conversation since the killing, a Turkish presidential source and Saudi state media said. The two discussed “the issue of joint efforts and the steps that need to be taken in order to shed light on the Jamal Khashoggi murder in all its aspects,” the Turkish source added. Speaking at the investment forum, Prince Mohammed said: “Many are trying to exploit the Khashoggi affair to drive a wedge between Saudi Arabia and Turkey”. But his image has been tarnished by Khashoggi’s murder, despite repeated denials he had any involvement. Riyadh’s changing narrative has met with deep scepticism abroad. “He showed a keenness to tell the world that he believes in due process and justice,” a British business delegate at the conference told AFP. US President Donald Trump said the Saudis had a “very bad original concept” in killing the 59-year-old Saudi insider-turned-critic. The investment conference, nicknamed “Davos in the desert” and aimed at drumming up funds to help Riyadh diversify its oil-reliant economy, has been overshadowed by the outcry over Khashoggi’s murder. A string of big names withdrew from the event after the crisis broke out. Faced with calls from US lawmakers across the political spectrum for tough measures, the State Department said it had identified 21 Saudis either whose visas would be revoked or who would be ineligible for future visas. British Prime Minister Teresa May said Britain was “taking action against all suspects to prevent them entering the UK. If these individuals currently have visas, those visas will be revoked today”. France also weighed in, saying it would take “punitive measures” if Saudi Arabia was “proven” to be behind the murder. The evidence included video and audio recordings from the consulate and the consul’s residence and were shared with visiting CIA chief Gina Haspel, Sabah newspaper reported. The location of Khashoggi’s corpse is still unknown. State media in Turkey said Wednesday that Saudi authorities had denied permission to Turkish police to search a well in the consulate’s garden. Erdogan vowed Turkey would not allow the culprits to get away with their “savage murder”. This entry was posted on 24 Oct 2018,09:22PM at 9:22 PM and is filed under World. You can follow any responses to this entry through the RSS 2.0 feed. Both comments and pings are currently closed.